When considering acetal material for your design, it is important to understand the different properties each grade poses. 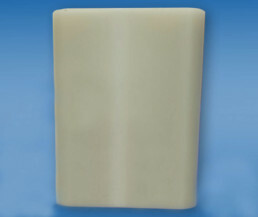 There are two basic grades of acetal available for machining; homopolymer acetal, most commonly known as Delrin®, a registered trademark of Dupont™ (Dupont™ is the only manufacturer of homopolymer acetal resin) and copolymer acetal. Homopolymers are plastics with molecular chains containing identical DNA repeating of sequence, while copolymers contain two different DNA sequences repeating. The acetals look the same, and the chemistry is similar enough that both products are still considered acetals; however, they have large differences in properties, which if overlooked can cause failures and be costly. Homopolymers and copolymers are not equal to one another, some large differences between the two are that copolymers have a lower water absorption rate and perform better than homopolymers in thermal, impact, wear, and chemical resistance. Homopolymers on the other hand have a higher crystallinity, and fatigue performance. Homopolymers are also known to be susceptible to develop centerline porosity when they begin to cool during the manufacturing process because the exterior portions solidify first, creating loss of volume in the interior. 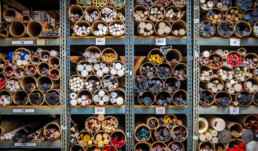 Centerline can typically be found as a small circle in the center of a part, as for sheets and rods, it will appear as a white stripe or band in the center or middle of the material. The root cause of centerline porosity in acetal is due to gasses trying to escape the strict extruded “shell” that restrains volume change, causing voids or pockets to form. Centerline porosity can cause many undesirable effects in applications such as, weaken the part, provide a route for leakages of liquids and gasses, and permit bacterial growth in food processing and/or medical applications. Copolymer is not as susceptible to develop center-line porosity; however, it is indeed important to keep it in mind that it does happen, and it is in your best interest to choose a different material if you have the option. When requesting a quote for acetal material you always want to make sure you are being quoted for the correct one, you can do this by asking the sales representative to read the second level of the specification. Tamshell Corporation machines all grades of acetal. To see if acetal will work for your design, call one our material experts today at 951-272-9395.